The Alpha: The KTM 500 EXC-F is the strongest dual sport bike in the world, although that doesn't mean it's hard to control. This motorcycle is as lean and civilized as a thoroughbred race horse. But let it rip, and its 4-stroke SOHC engine blasts the cutting-edge chassis across any terrain you choose. Ahead of the competition. No sweat, just glory. Small in dimensions, sky-high on output. The KTM 500 EXC-F's fuel-injected powerhouse makes it the most compact and lightest 500 on the market, while delivering groundbreaking torque and power figures over the entire rev range thanks to a single overhead camshaft cylinder head and the latest electronic fuel injection. Class-leading and cutting-edge: just the way we like it. Cylinder head: A single overhead camshaft controls intake and exhaust through optimized ports, while a cutting-edge combustion chamber and water jacket create mind-blowing power while managing heat. The engine's four valves rely on extremely rigid rocker arms. Double lateral brackets fix the engine to the frame and reduce vibrations. 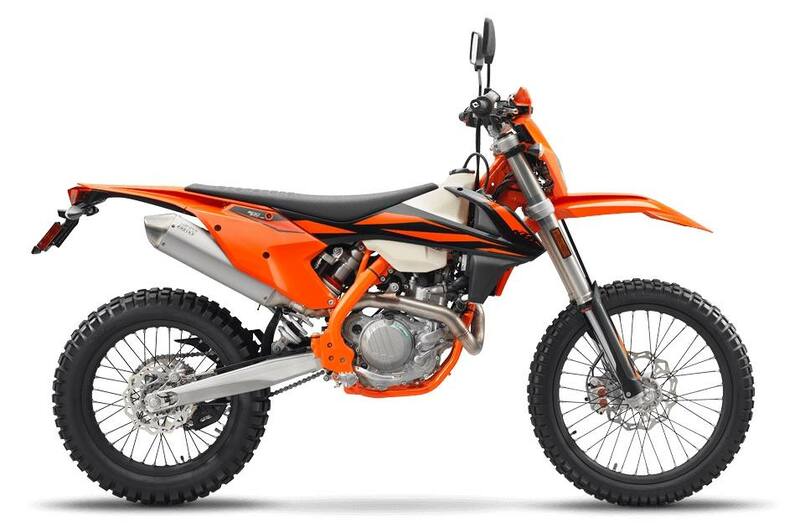 Crankshaft: The KTM 500 EXC-F's crankshaft utilizes a short connecting rod, which makes for an overall compact and lightweight engine with a snappy power delivery. A plain big (bottom) end bearing with two force-fitted bearing shells runs directly on the crank pin. The necessary oil feed for this bearing is ensured by the engine's pressurized lubrication. This design is a decisive benefit in terms of the crankshaft service interval, which can be lengthened due to the plain bearing. So just pin it, all day long. Crankcases and engine covers: The design of the die-cast crankcases allows for minimal weight and a very centralized shaft configuration. This makes the engine short and compact, while contributing to an efficient centralization of masses. The engine covers also feature a solid surface structure, which reduces the wear caused by the rider's boots. This way, your EXC-F will keep looking better longer. Cylinder and piston: Inside the cylinder, with a bore of 95mm, thumps a forged box-type piston with an ultra-light piston pin. Its crown geometry is adapted perfectly to the combustion chamber, where its rigid structure and low weight shine. Thanks to low oscillating masses, the engine is as smooth as it's powerful. 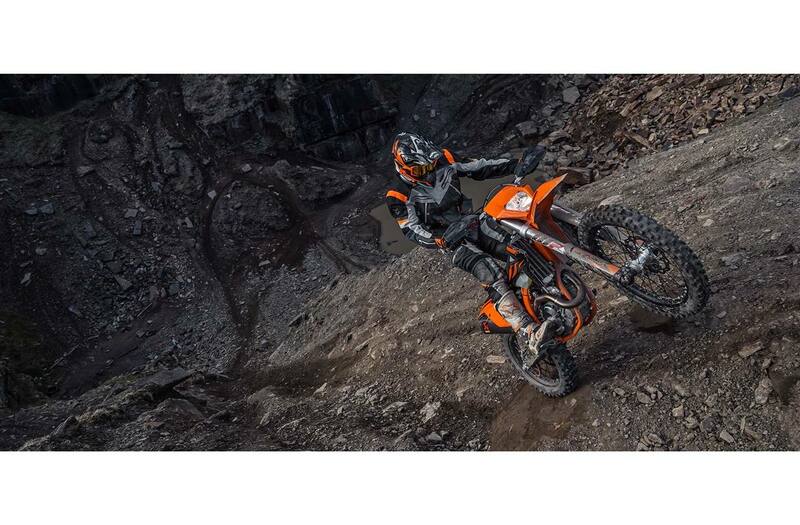 Clutch: The KTM 500 EXC-F employs the KTM-developed DDS clutch (damped diaphragm steel) with a wear-free steel basket and extremely heat resistant clutch plates and nitrated steel liners. This clever design employs a diaphragm spring instead of the usual coil springs, making for considerably easier clutch action. A diaphragm spring also leaves sufficient space for a damping system to be integrated into the clutch hub. The goal is traction, but durability is as well. Light operation and telepathic amounts of control are standard with this hydraulic Brembo actuated clutch. E-Starter: The KTM 500 EXC-F is fitted with a unique E-starter as standard, which is a clear advantage when it comes to crunch time in the heat of battle. A strong starter motor and a reliable lithium ion battery will fire up your 500 time and time again at the push of a button. In order to reduce weight to the minimum, there is no kick-starter system. You won't miss it. If by any chance you do, just retrofit a KTM PowerParts replacement kit to get your kicks. Exhaust: Noise limits are a real challenge for every manufacturer. Therefore, KTM has put a lot of effort into the development of its exhaust systems. All 4-strokes are fitted with a short high-end aluminum muffler, mounted as close to the engine as possible. This means more power, extra mass centralization and better rideability. An advanced internal design reduces the noise sufficiently to sit safely below the noise limit, while still providing the engine response and performance that is expected from a KTM.